Every now and then a product comes up for review that I need, but had no idea I needed it until I got it. That's exactly the case here for Everyday Education and their amazing Transcripts Made Easy: The Homeschooler's Guide to High-School Paperwork. Mr. B is only in 8th grade right now, and our state does not mandate the use of transcripts, but many colleges will require this. As a result, I knew transcripts were something I needed to start thinking about at some point, but I didn't really think I needed to start thinking about them NOW. Well....I was wrong. Now is the perfect time to get started, learning everything I need to do now in order to make the process easier for then. 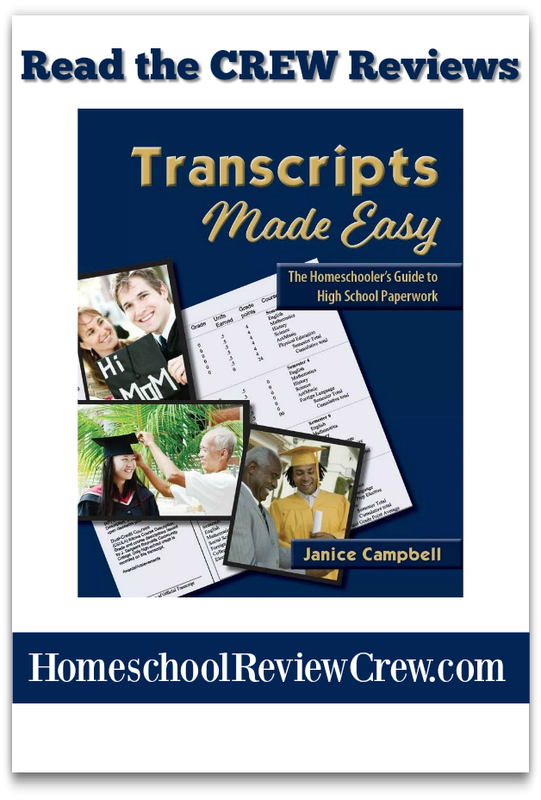 Transcipts Made Easy: The Homeschooler's Guide to High-School Paperwork isn't just a "How-To" style book on transcripts. It gives fantastic, real world...been there, done that, information on colleges, what your student will need to know to succeed, and more. Janice Campbell initially wrote this when she had just finished writing out her own son's transcripts. The process was so daunting at the time, that she knew she never wanted to experience that again, so from that came this amazing book-which is available as a physical book, eBook, or a print/eBook package. This isn't just your average "I'm a homeschool mom, here's what we did" kind of book. Noooo it is not! First, this book was originally written in 2001, and has sold thousands of copies around the globe. With each new edition, more than just the cover was changed! Each time, she added in information she learned that was helpful. From her days working in a college as a Homeschool Admissions Counselor to experts in the field of students with special needs to a new guest chapter from Professor Carol Reynolds, who weighs in with her opinion and advice to parents to help prepare their incoming freshman students for success their first year and beyond. This is definitely not your average "How-To" style book! Here are snips of the Contents Pages so you can see how full this book truly is. Each section tells you what is going to be covered in a very easy to read, easy to understand format. Then it goes on to tell you how to achieve this goal. I really appreciate how this is written in a comfortable tone vs. a stuffy, more clinical tone. I also appreciate the effort that has gone in to include middle school parents, as well. It is never too early to plan for the future, and get a head start. All too often our kiddos start taking high school level classes in their 7th and 8th grade years, these classes should also be tracked for transcript purposes. My favorite pages detail Skills and Habits your child should develop in high school to carry on into college. Study skills and note taking are skills that are often overlooked-not just in homeschoolers, but in regular brick and mortar students, as well. Homeschoolers tend to have more of a self disciplined approach that aids them in their college career, but this doesn't negate the need to foster and build up study skills. I also really like the pages that give information on typical college requirements, and sample high school requirements that are needed to get into most colleges. Of course, any college your child is thinking about applying to will have their own set of admissions requirements that you need to know about, but these pages provide invaluable insight in how to prepare for any college. The actual transcript models are given two different ways. There's a horizontal model and a vertical model. Either are acceptable, and really a personal preference. Not only that, but she gives very clear details on how to set this up on your own, using tables. It's honestly that easy. With the directions that clear, you can also choose to tweak it to fit your specific needs, as well. This is more than a guide to transcripts. It has a writing rubric, how to issue grades, what percentages are what letter grade, how to calculate GPA, and special notes for special needs students. One of the most common questions I hear is "What is a credit?" Well, guess what?! This guide has a section just for "How to Grant Credit" and it tells you how to go about issue credits. In the end there's a same High School Diploma, with instructions on creating your own, as well. We may not need this book right this very second, but I am so blessed and thrilled to have it now so that we can get a head start on the transrcipt process to make it that much easier when it is truly needed! This guide really breaks down the transcript process to make it easy for parents to keep records, record the transcript, and get insider advice on the process of college admissions and what their student will need to succeed! We are only one of 50 families to be blessed by this product! Please click the image below to go to the Homeschool Review Crew Blog to read their reviews, as well!